Invest in programmatic advertising with Italiaonline: the best automatic planning aimed at more targeted and efficient campaigns. Thanks to the automated sale of online advertising space through computer platforms, programmatic advertising helps you reach the right target, in the right place, and at the right time. Without waste and with high completion rates. Essentially, programmatic advertising technologies automate the sale of impressions, the audience segmentation, and the optimisation of digital advertising space. By using user browsing data, crossed with target profiling, advertisements are only shown to those who are really interested. Furthermore, this is always done at the cheapest cost possible and in real time. Every day, over 4.7 million unique users visit our sites and use our services, generating thereby more than 75 million daily page views. All major metrics and statistics are on our side: our viewability indices, in-target values ​​and completion rates lie at the top end of the market. We protect the brands of our advertisers. Our inventory holds no blind networks, but only unencrypted sites that are editorially controlled by our content curation staff. With the guarantee of exclusively human traffic. We do everything we can to offer our advertisers high-quality and exclusively excellent visibility by placing ad spaces above the fold, maintaining low advertising pressure, while avoiding rich concurrent formats on the same page. We support all major SSP platforms to make our inventory available at all times. We have a DMP platform with which we duly collect our users’ behaviours, interests and needs. And our first party data, that is to say our customer base membership, contributes to measuring ComScore’s Target Audience. 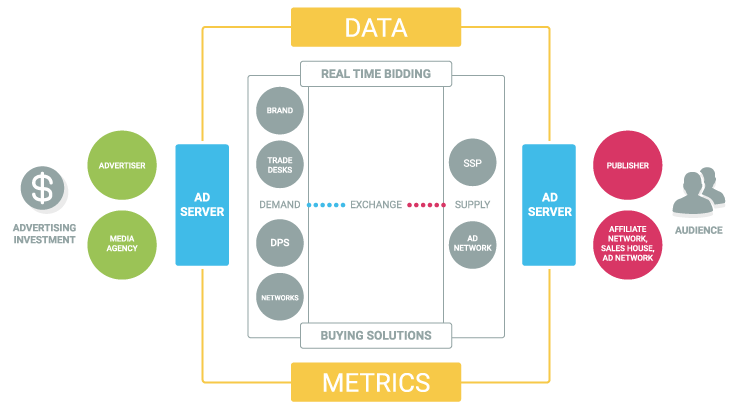 We manage all types of programmatic buying transactions, from real-time public or private bidding auctions, to automated guaranteed and with an audience, to private deals in private marketplaces. When the target-profiled user connects to a site of our properties, a real-time automated auction assigns the impression to the advertiser that has offered the highest price for that space and user type. You can buy a guaranteed number of impressions in our inventory at a fixed price through a direct agreement between both of us, where demand and process traffic are automated. And we can also manage Guaranteed Audience, integrating our data, or integrating on behalf of the Trading Desk the customer’s first-party data. To meet the increasing needs of our advertisers, we pre-trade and agree directly with them the price of impressions within a private marketplace. In addition, our deals are first-look, i.e. traded at the same level of priority as traditional reservation campaigns. We place no limits on creativity. In programmatic advertising, we manage all IAB display, native, interstitial and video formats. Are you interested in making programmatic advertising on our inventory? Call the toll free phone number 800 011 411 or send us your request by filling out the form and one of our consultants will get back to you as soon as possible.